The Stadler GTW family of articulated railcars are widely used across the world. Image courtesy of Stadler Rail AG. A Stadler GTW operating on the Milan-Molteno-Lecco line in Italy. Image courtesy of Stadler Rail AG. Stadler Rail sold more than 500 GTW railcars till date. Image courtesy of Stadler Rail AG. Arriva is one of the major customers using the Stadler GTW articulated railcars. Image courtesy of Stadler Rail AG. A side view of GTW articulated multiple-unit train operated by Arriva. Image courtesy of Stadler Rail AG. Stadler GTW articulated railcars can run at a maximum speed of 140km/h. Image courtesy of Stadler Rail AG. Stadler GTW (Gelenktriebwagen) is a family of articulated railcars manufactured by Switzerland-based Stadler Rail. Over 500 GTW articulated railcars have been delivered to customers across the world. The GTW articulated railcars are used by Arriva, A-train, Connexxion, Ferrovie Udine Cividale (FUC), Ferrovie Nord Milano (FNM), Sistemi Territoriali (ST), Southern New Jersey Light Rail, (SNJLR), Capital MetroRail, Rack railway of Puy de Dôme and SBB-CFF-FFS (Swiss Railways). "Over 500 GTW articulated railcars have been delivered to customers across the world." The base variant of the GTW articulated railcars family is GTW 2/6. The ‘2/6’ denotes that two of the six axles are powered. The multiple variants derived from the GTW 2/6 include GTW 2/8, GTW 4/8 and GTW 4/12. The GTW 2/6 consists of a driver module and two passenger modules. The GTW 2/8 includes one drive module and three passenger cars, while the GTW 4/8 consists of two drive modules and three passenger cars. The GTW 4/12 variant includes two drive modules and four passenger modules. The GTW articulated railcars are offered in diesel-electric configurations and electric versions for all common voltages. The modular design of the GTW railcars fulfils the requirements of track gauge, structural clearance and passenger capacity. The unconventional design incorporates power module in between the passenger cars. The power module is provided with a passage for commuters. The carriages are constructed using aluminium sections. Each passenger car is semi-mounted on the power module. The standard GTW can be attached with additional control cars. The power module and the end carriages are split to eliminate the transfer of noise or vibrations into the passenger cars. The end carriages offer additional internal space for the passenger as they comprise no heavy drive components. The entire available clearance gauge can be used for integration of additional facilities. Each passenger car is provided with an air conditioning system, closed toilet system and facilities for disabled passengers. Stadler FLIRT is an electric multiple unit (EMU) manufactured by Stadler Rail, a Switzerland-based rail manufacturer. FLIRT stands for Fast Light Innovative Regional Train. These trains are manufactured for operations on suburban and regional railway lines. The GTW articulated railcars include more than 65% of the low-floor portions. The vehicle can be custom-built according to the customer’s requisites. The length and width of the cars can be modified to meet the requirement of available clearance gauge. All the systems and drive components are designed to be approachable from the outside for ensuring easy maintenance. The design also avoids the capital investment that is required in the workshop and minimises the maintenance and repair schedules. The GTW articulated railcars are powered by electric and diesel-electric propulsion. The electric propulsion module using the 1.5kV DC supply voltage will deliver 600KW to 1,100kW power. Each diesel propulsion module delivers a maximum power of 600kW. The propulsion system provides speeds ranging from 115km/h to 140km/h based on the number of power modules and carriages. Stadler Bussnang received a €20m order from Sistemi Territoriali in November 2004, to supply five diesel GTW articulated railcars for Adria-Mestre and Udine-Cividale lines in Italy. Arriva placed a €30m order with Stadler for seven GTW electric multiple units (EMUs) in November 2006. The first GTW unit was rolled out in April 2008. In February 2009, Stadler Rail received a €50m contract from Graz-Köflacher Bahn und Busbetrieb (GKB) to supply 13 diesel electric GTWs. The trains are currently being operated on the Graz – Köflach and Graz – Wies – Eibiswald lines. "The GTW articulated railcars are offered in diesel-electric configurations and electric versions for all common voltages." The Denton County Transportation Authority (DCTA) placed a $74m contract for 11 GTW DMU 2/6 articulated railcars in May 2009. The contract also consists of an option for 25 more vehicles. 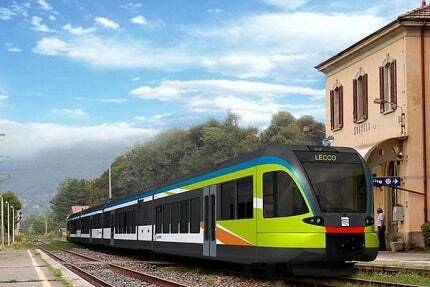 In July 2009, Ferrovienord (FNM Group) placed a €90m contract for 19 GTW articulated railcars for use on Milan-Molteno-Lecco and Brescia-Iseo-Edolo lines. The contract also includes options for additional vehicles. Stadler received an order for six two-carriage GTW 2/6 diesel railcars as part of a €146m contract awarded in January 2010. In July 2010, Arriva Netherlands awarded a €140m contract to Stadler Rail for 38 GTW articulated railcars. The first diesel-electric articulated multiple-unit train (DMU-GTW) was launched in May 2012, while the first EMU-GTW was rolled out in June 2012.